The Honda HRZ216TDA Harmony II’s swiveling front wheels and dual blade cutting system make mowing a snap, but like any mower, it needs proper maintenance to keep performing. Here’s everything you need to know about servicing these mowers. Before each use: Check the condition of the blade, grass bag, and air cleaner. Make sure the oil level is correct and the blade bolt is tight. First month or 5 hours: Change the oil. Every 50 hours: Change the oil. Every 100 hours: Check the spark plug and flywheel brake. Clean the spark arrester (if equipped) and caster wheel lock pins. The throttle cable and flywheel brake pad should be checked and adjusted by a dealer. Every 150 hours: Replace the air filter and spark plug. Have a dealer look at the idle speed and clean the fuel system. Every two years: Check the fuel line and replace if necessary. 1. Turn the fuel valve to “OFF” and disconnect the spark plug cap from the plug. 2. Tilt the mower to the right so that the carburetor is pointed up. This prevents flooding which can make the mower hard to start. Inspect the blades. If they are heavily worn, bent or cracked, replace them. 1. Place a wood block inside the mowing chamber to keep the blades from turning. 2. Unscrew the two 14 mm bolts and pull the blades away from the holder. 1. Place the narrower upper blade on the blade holder, followed by the lower blade. 2. Place the washers onto the bolts with the curved side facing away from the heads. To remove the bag, unclip the plastic edges from the frame. To reinstall the bag, clip it back onto the frame by rolling the fabric from the outside to the inside. To clean the bag, wash it out with a garden hose and allow it to dry before use. 1. Unscrew the dipstick/filler neck and wipe it clean. 2. Reinsert the dipstick, but don’t screw it in. Pull it out. The oil should be on the textured area at the end of the stick. Add more oil as necessary. 3. Screw the dipstick back into the engine. 2. Tilt the mower to the right, letting the oil flow out of the dipstick opening into a container for recycling. 3. Set the mower back on its wheels and add oil. 1. Press the tabs in on the filter cover, then pull it away to remove. 2. Pull out the filter. Wipe the inside of the cover and filter housing. 3. Tap the filter or blow it out with compressed air (not exceeding 30 PSI) to remove any dirt. 4. Reinstall the filter and cover. 1. Disconnect the plug cap and wipe away any dirt around the plug. 2. Remove the plug using a spark plug wrench. 4. Reinstall the spark plug and cap. When the plug seats, turn an additional 1/8-1/4 turn. If the plug is new, turn another 1/2 turn. 1. With the engine cold, remove the three bolts holding the muffler shield. Slide the shield off of the muffler. 2. Remove the set screw from the spark arrestor. Slide out the arrestor. 3. Use a brush to remove carbon deposits from the arrestor. Replace the arrestor if it has cracked. 4. Reinstall the arrestor and muffler shield. With the engine running and the throttle set to “Fast,” release the brake lever. If the engine doesn’t quickly stop, have the mower looked at by a dealer. Remove both front wheel covers and move the lock lever between the “Lock” and “Release” positions. The lock pins should move freely, locking and releasing the wheels with each motion. If they don’t, clean any dirt from the pin area and apply grease to the pin. Need parts? 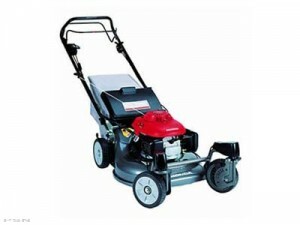 Hondalawnparts.com is an OEM dealer offering parts for all of Honda’s power equipment including mowers like the HRZ216TDA. Whether you need blades, a spark plug, or a major component, Honda Lawn Parts can help you find what you need and they can ship it to any address in the U.S. or Canada. Have another model of Honda mower? We already have tips for maintaining the HRR216PKA and HRR216 on our blog. This entry was posted in Uncategorized and tagged Honda Lawn Mowers, Honda OEM Replacement Parts, HRz216TDA by Admin. Bookmark the permalink.